Home » Observations » The ups and downs of a creative life. It is not often that i talk about things going on in my life, my non-fibery life, I am a very private person. While I do post pics of my kids, my outings, and pics of things that inspire me and I want to share, I do not post details online anywhere about the things that might be looming large in my life that maybe make me sad, or scared, or stressed, simply because I am not comfortable to be that public with it. Its just me. But I have had plenty of all of those things over the last year, which seemed to be a year that simply lurched from awful to truly awful on and on. I am posting about it now because (i hope!) it is now behind me and I have the time and space to reflect on it and where I am at the moment because of it. Having said that, I am still not going to write about everything that has happened! But I did want to share that at times this last year I have been MIA, I have been here but simply not present as I would wish to be. I feel like I have been swimming through a tank of glue, and while I could see you, I struggled to speak or to interact in they ways I used to. It started on the day my Mum passed away, and continued for some time after my Father also passed away within that same year. Some of the ‘things’ occurred as a consequence of those major events and some happened purely coincidentally yet rather unfortunately at the same time. I will not go into more detail, but the end results of the series of unfortunate events is that on top of losing my parents, I moved house three times in the last six months, including the buying and selling of property, we had unexpected family issues of some import that caused a degree of pain, and I remain here in New Zealand with my children on my own, which was also not really part of the plan. Yet while I say the ‘end result’ and list a bunch of pretty majorly negative life events, it isnt actually the end, and those events themselves are not actually the real results. And this is why I am writing this now. It is very true that what doesn’t kill you does make you stronger. I already felt that I was a relatively strong person, I never got stressed much, I took biggish risks with the knowledge that if things fell apart I could put them back together. I think I am lucky to be pretty resilient and self reliant, this has helped me a great deal! In the last months I have been through more stress than I thought at times I could manage, often feeling like my path and choices were being held in the hands of others, the bank managers, the lawyers.. other people making decisions about my possibilities. I realised this is what was stressing me the most. I consciously began to take control of each day, one at a time, it was the only way I could get through the waiting and feelings of helplessness. The need to care for my family overpowered any desperate feelings of wanting nothing more than to stay hidden under my blankies hoping it would all go away. Each day was like wading through thick mud but I can honestly say I did not realise how low I had gone until I started to feel a bit better, once the stress was lifted from me, we were in our new (long term) home, everything was in place again.. At this point I discovered I was having fleeting glimpses of my happy place, immediately followed by having to remind myself that it was ok to go there, the fight was over and it was time to relax and smell the coffee 🙂 It was a wake up call to find I needed that reminder and that I had been feeling like i couldn’t afford to let my guard down even for that small moment. I also realised how damaging all this is to creativity, now that it is returning. I am finding myself now feeling inspired to create, in that wonderful compelling way I used to, my list of projects that I cant wait to begin is growing again 🙂 I am more able to think, interact, and extend myself outside of the box that I had put myself in. Isnt it odd how much of this is not seen until it is over, stepping back outside the box has changed my perspective enough to see clearly where I was, while during my enclosure in it I had no idea it was there. Here is my new current project – destined to be cushions in my new nest/house..
Next I will be playing with something new to do with art yarns that involves my sewing machine and some lockspun mohair. If it works, I will share a tutorial 🙂 I am excited to be back, and looking forward to sharing more of the good! Been there, done that, got the scars. Having that second cup of coffee and loving the inspiration, both of your creativity and strong spirit. Sometimes the sharing is part of the healing and the return of creativity is a sign wounds are closing. you can do it girl, yes you can. Blessings Suzy! Always look for the ray of light. Your Fibery Goodness Groups are a ray of light to me. Thanks so much for that! Know you are in my heart and prayers! good luck with your new start! 2012 was a year like that for me. It killed my creative mojo for awhile, as well. It came back, though, stronger and better than ever. I am sorry that this year has been bad for you, but so glad to hear that you are finding a new happy place! Thanks for sharing your heartfelt story. After my husband took his life two years ago, I didn’t think I would ever enjoy life (my fiber arts) again. It took me a good year to even start creating again, but my son just brought me a new loom from Japan, and I am creating again. You’ve been an inspiration to me. Holding good thoughts for you! I’m so sorry for all your losses. And I am happy for you that you are living outside of that box again. I truly know how that feels and it resonated so much with me when you said that you didn’t even know you were living in that box until you got out of it. That is always the same for me in times of extreme stress. And the part about the creativity going away, too. It just shows that the myth about great pain creating great art is just that for most of us: a myth. I think about you a lot lately, especially since I started spinning. I miss geeking out with you over anything fiber and I’m glad you get to feel excited about it all again. I hope this year (and all the ones after that) is going to be smashingly wonderful for you. Thank you for writing this. I’m really sorry about the loss of your mom and dad. Within a year of each other is a lot to take. My mom died about a month ago and it’s been very hard. The creativity piece really takes a hit in my life too, when I’m under mega stress and grief. I’ve been scared at times over this last brutal year I’d never get it back fully. I’m trusting I will. Just taking it day by day. Your post helps. Having been on my own journey to the depths and working on my way back I truly understand the roads that must be traveled. While not always pleasant we do learn from them and are stronger at the fork in road where we make our choices. Love and light to you and yours and may all your choices be easy ones. Thank you so much for sharing. What a journey! 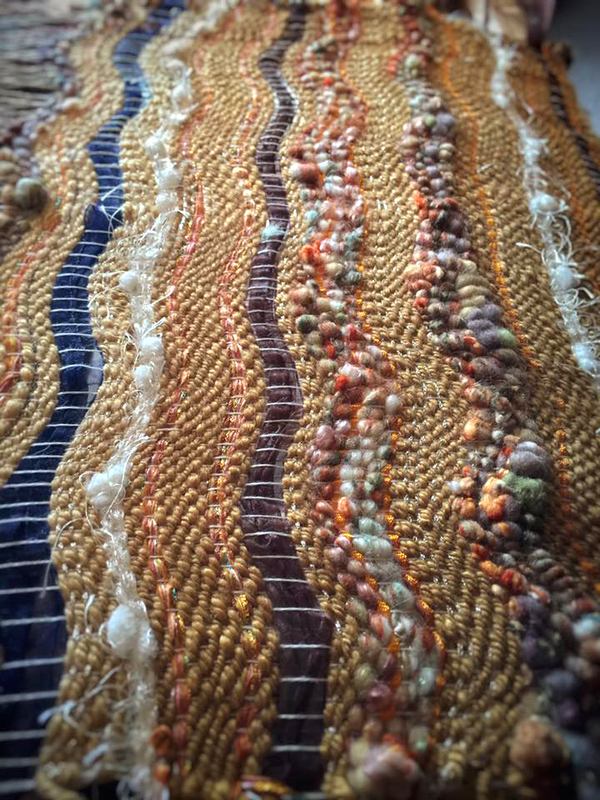 Your fibre work is gorgeous and so inspiring. As you spoke about your list of projects excitement rose in me too. I love the cushion weaving. Don’t look back too much, it’s not the way you are going!! Glad you are getting on track, it was a helluva year for you!!! Thanks Jan 🙂 I make it a policy to never have any regrets, there is always something to be learned! This coming year is going to be a good one! Thank you for sharing. Love the weaving and the new idea using the sewing machine and locks. Can’t wait to see the end result. Take care and enjoy your coffee.